Kim Thúy makes every word count in her new novel, Mᾶn. She says so much with very few words. Her writing is beautiful and poetic. The story tells about Mᾶn’s new life in Montreal as a cook at her husband’s restaurant. There is a lot of wonderful detail describing the food Mᾶn creates for her customers. It also flashes back to her mother’s life as a girl in Vietnam, including some time during the Vietnam war. This story is primarily about love in its many forms; art, work, family, friends, and romantic love. But there are other elements to the story that make it a unique reading experience; Vietnamese culture and food, the experience of immigrating from Vietnam to Canada, the differences in familial relationships in two different countries, duty and expectations between husband and wife, the expression of parental love, and the life changing whirlwind of unexpectedly falling in love just when you thought your life was happy and fulfilling. In less than a second his face appeared, and in that exact moment I was in the present tense; a present without a past. They say that happiness cannot be bought. What I learned from Julie is that on its own, happiness multiplies, is shared, and adapts to each of us. It was within that happiness that the years accumulated… I only know that, very early one morning, I opened my eyes and saw a world so perfect it made me dizzy. At that precise moment, I knew that I would always remain standing, that he would never think of making room for me beside him because that was the sort of man he was, alone and lonely. I had all of eternity because time is infinite when we don’t expect anything. I love that she is able to entwine the experiences of food and life, making them a part of each other, as though they are inseparable. Just one dish per day. One memory at a time, because it took a lot of effort not to let my emotions overflow the plates. When mothers taught their daughters how to cook, they spoke in hushed tones, whispering so that neighbours couldn’t steal recipes and possibly seduce their husbands with the same dishes. I hoped to be able to serve and be a companion to my husband without disturbing anything, a little like flavours that are hardly noticed because they are ever-present. Tears ran down his cheeks when I sprinkled his bowl with a small spoonful of pickled garlic. Eating that soup, he murmured that he had tasted his land, the land where he’d grown up, where he was loved. This book is full of beauty and truth, and experiences that many of us can relate to. Not to mention the creation of food that sounds more like art. 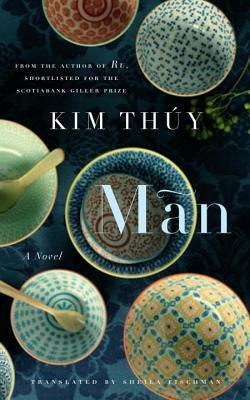 Reading Kim Thúy’s second book has made me want to go back and read her first. Ru won the Governor General’s Award for French Language Fiction in 2010, as well as being shortlisted for the 2012 Scotiabank Giller Prize. Good to know you also loved Ru. I can’t wait to read it! Just went and read your review- so well done! I especially loved the cultural aspect of the book. You make so many wonderful points about the book. I was so pleasantly surprised by Man and I’m definitely going to try reading Ru before the year is over. Thanks, C.J.! I was also surprised by how much I liked it. The cultural differences are so interesting. Thanks, Cecilia! Vacation was wonderful! 🙂 And, it’s nice to hear from you, as well! I feel like you haven’t been around as much lately. Hope all is well!